Adaxes enables you to import and export Active Directory data in a number of data formats, including LDIF, DSML v.1, DSML v.2, XLSX, CSV and HTML. 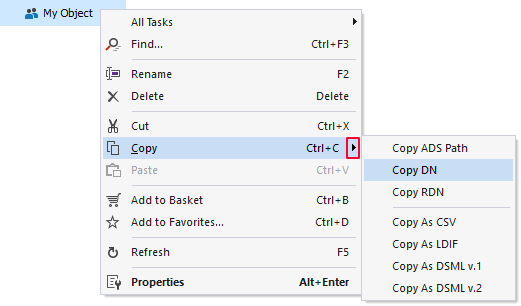 In this tutorial, you will learn how to import a CSV file (a text file with columns separated by commas) with user accounts into Active Directory. For instructions on how to automate the import of user accounts, see Schedule Import of Users from a CSV File. The column headers in the file must exactly match property names of user objects in Active Directory. For example, if you want your CSV file to contain Full Name, First Name, Last Name, Department, User Logon Name and Password fields, the file should contain the following column headers: cn, givenName, sn, department, sAMAccountname, unicodePwd (or AccountPassword). See also: User Object User Interface Mapping. Also, your CSV file can contain separate columns for user Account Options. The column values can be set to true or 1, false or 0. CannotChangePassword Specifies whether the account password can be changed. ChangePasswordAtLogon Specifies whether the password must be changed on the first logon. PasswordNeverExpires Specifies whether the password of the account can expire. Enabled Specifies whether the user account is enabled. AccountNotDelegated Specifies whether the security context of the user is delegated to a service. TrustedForDelegation Specifies whether an account is trusted for Kerberos delegation. AllowReversiblePasswordEncryption Specifies whether reversible password encryption is allowed for the account. SmartcardLogonRequired Specifies whether a smart card is required to logon. PasswordNotRequired Specifies whether the account requires a password. UseDesEncryptionTypes Specifies whether Data Encryption Standard (DES) is supported for the account. DontRequireKerberosPreAuth Specified whether Kerberos pre-authentication is required. 66050 - disabled account, password never expires. For more details, see: How to use the UserAccountControl flags to manipulate user account properties. By default, all imported user accounts are disabled and have a blank password. Add AccountPassword column to your CSV file and specify a password for each user in the column. Configure Property Patterns to generate initial passwords for new users. For details, see Generate initial password on user creation. Add Enabled column to your CSV file and specify true or false for each user in the column. Assign default values for user account options. For details, see Set default account options for new users. 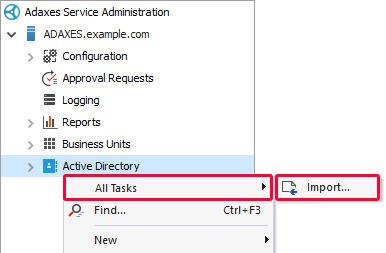 Expand your Adaxes service, right-click Active Directory, point to All Tasks and click Import. Select the file to import and click Next. If your CSV file contains multi-valued properties, specify what delimiter is used to separate property values. In the Name section, select the column that contains the full names of users. Specify the Organizational Unit or container where the imported user accounts will be created. In the Object Type section, select User. 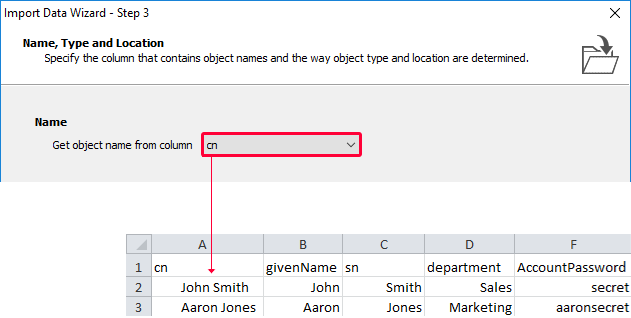 If your CSV file contains DN and objectClass columns, the location where the objects will be created, their names and object types can be retrieved from the columns. You can also update existing user accounts during data import. To do it, check the Update existing objects checkbox on the Import Settings step of the wizard. To import user accounts using PowerShell, you can use a standard PowerShell cmdlet Import-Csv. The cmdlet will read in the CSV file and create a set of PowerShell objects, one object for each row of the CSV file. To create user accounts in Active Directory, you need pass the objects to the New-AdmUser cmdlet. The Import wizard and PowerShell cmdlets have different requirements on the data format and column names of CSV files. 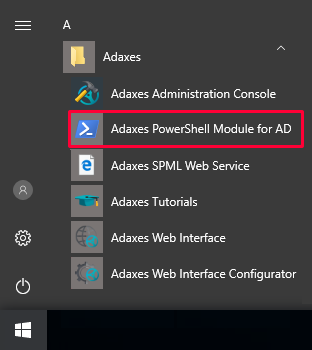 For information on how to install Adaxes Powershell Module, see Install Adaxes Powershell Module for Active Directory. The parameter -Path specifies the distinguished name DN of the Organizational Unit or container where new users will be created. If your CSV file contains column AccountPassword or columns with data of the Boolean type (e.g. Enabled or ChangePasswordAtLogon), the columns must be processed in a special way. For information about the cmdlets included in Adaxes PowerShell Module, see PowerShell Module. To import and export Active Directory data from the command line you can use utility admimex.exe. It is installed with Adaxes Administration Console and by default is located in C:\Program Files\Softerra\Adaxes N\Administration Console. If specified, the import operation is performed. If not specified, the export operation is performed. Specifies the format of the file to import from or export to. Possible values for data export are LDIF, DSML1, DSML2, CSV, TXT, HTML, EXCEL. Data can be imported in LDIF, DSML, and CSV formats only. Specifies the name of the file to import from or export to. Specifies the Adaxes service host. If not provided, the default value localhost is used. Specifies the user account used to perform the export or import operation. Specifies the password of the user account used to perform the export or import operation. Specifies the object DN to start the export from. Specifies the LDAP search filter for exporting AD objects. Only the objects that match the specified filter will be exported. If the parameter is omitted, the default value (objectClass=*) is used. BASE - only the object specified by the /r parameter is exported. ONE - export is only performed for the direct children of the object specified by the /r parameter. SUB - export is performed for the object specified by the /r parameter and all of its descendants. If the parameter is omitted, BASE is be used by default. 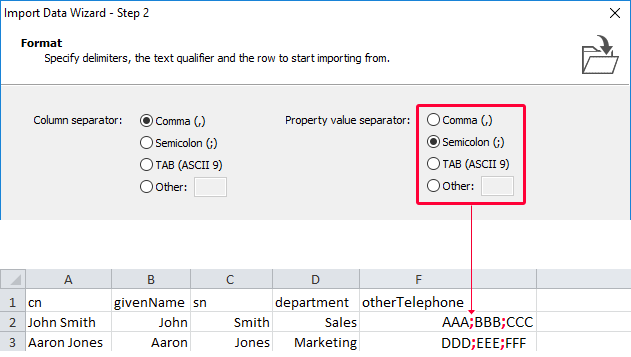 Specifies a comma-separated list of AD object properties to export. If the parameter is omitted, WIN is used by default. Specifies the search page size for data export. The page size specifies the maximum number of records returned for each search request. If the parameter is omitted, the default value 500 is used. Disables generation of the document header. The document header contains export date/time and information about the source, etc. Disables indenting in the exported document. The option can be used for DSML1, DSML2, and HTML formats. Disables the transformation of property values into human-readable form, so all properties are exported as they are stored in the Active Directory. If the option is omitted, values of some properties will be converted into human-readable form. The option can be used for TXT, CSV, HTML and Excel formats. Specifies that SAM-specific properties are not excluded during export or import. Specifies the DN suffix to replace. If specified, the suffix of the imported or exported objects is replaced with the suffix specified in the /ct parameter. This can be done, for example, to import exported objects to another location. Specifies the suffix, with which an object DN part will be replaced. The value replaces the suffix of the imported or exported objects specified in the /cf parameter. This can be done, for example, to import exported objects to another location. Specifies the delimiter used to separate columns in TEXT and CVS files. If the parameter is omitted, the default value ';' is used. Specifies the delimiter used to separate property values in of multi-valued properties. If the parameter is omitted, the default value ',' is used. Specifies the text qualifier for TEXT and CSV files. Text qualifiers are used to identify the boundaries of strings. If a field separator character appears within the boundary, it won't be considered as a delimiter. If the parameter is omitted, the quotation mark (") is used as the default value. Specifies the row, starting from which TEXT or CSV file will be imported. If the parameter is omitted, the import starts from the first row. Specify the parameter, if your file contains a header. If the parameter is omitted, the default value SINGLE is used. If the parameter is set to GENERAL, Excel will auto-detect the cell format depending on the value of each particular cell. If the parameter is omitted, the default value TEXT is used. If this parameter is specified, the 'Object already exists' error will be thrown if an imported object already exists in Active Directory. If the parameter is omitted, existing objects will be updated with the data from the CSV file. NONE - do NOT replace DN suffixes in object properties. EXISTING - replace only DNs that refer to the objects from the import file. ALL (default) - replace all DNs. If specified, all records will be imported in the order in which they appear in the import file. If not specified, the order will be changed if necessary (child objects will be imported after parent objects). 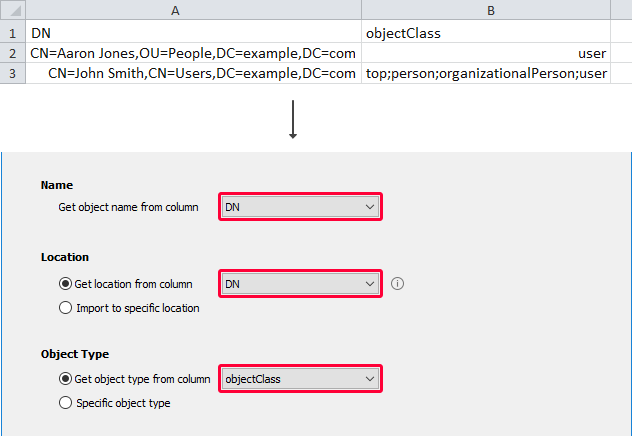 If specified, all object properties that refer to other objects (DN syntax properties) will be saved to the directory after all objects are imported. This is useful if a parent object contains a DN syntax property referring to a child object. Forces to freeze the header in EXCEL documents keeping it in view while scrolling through the file. Example 1: Export a specific user account to an LDIF file. admimex.exe /d LDIF /f c:\file.ldif /r "CN=John Doe,CN=Users,DC=example,DC=com"
Example 2: Export the objects located in the Users container to an LDIF file. Example 3: Import data from a DSML file. admimex.exe /i /d DSML /f "c:\file.xml"
Example 4: Export the objects located in the Users container using the specified credentials. Example 5: Export the objects located in the Users container using an ARG file. Example 6: Export only inetOrgPerson objects from the Users container. Example 7: Import objects to the New Users container, if they were exported from the Users container. admimex.exe /i /d LDIF /f C:\file.ldif /cf "CN=Users,DC=example,DC=com"
Example 8: Export only the Display Name and Telephone Number properties of AD objects. Business Rules that are triggered after creation of new user accounts are also applied during data import. For example, if you have a Business Rule that creates home folders for new users, it will also create home folders for the users created during the import process. For details, see Automate User Provisioning.